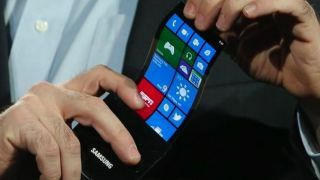 There's been a few whispers lately that Samsung's long-in-development flexible screen technology is ready for action and may arrive soon in the form of a Galaxy Note 3 variant. Well, you can turn that anticipation up a notch now that a mystery device with called the SM-G910 has seemingly made an appearance in benchmarking tests. The as-yet-unannounced device bears a slight similarity to the Note 3's model number (SM-N900), but also lists a couple of the same specs, the Snapdragon 800 processor and Adreno 330 graphics chip. Previous speculation has suggested that the flexible version of the Note 3 would pack a slightly smaller 5.5-inch display and arrive within the month of October. Samsung's journey towards a curvy, unbreakable 'Youm' display has been going on for a few years now and was last demonstrated at CES 2013 in Las Vegas. Many observers unsuccessfully predicted the tech would find its way into the flagship Samsung Galaxy S4 or the recently-announced Galaxy Note 3. Earlier this week it was rumoured that an LG Z1 handset would attempt to beat Samsung to market with a flexible smartphone. Has the time finally come for flexible displays to shape the future of smartphones? When will your smartphone become your flexible screen? We take a look at what's going on with bendable screens.